This is a hugely entertaining, humorous and exhaustingly-paced German thriller from writer/director Tom Tykwer, starring Franka Potente – of The Bourne film series fame. The innovative visual style using several different filming techniques, the palpable sense of urgency, the pulsating techno score and an array of unique characters makes Run Lola Run an incredibly fun and exciting experience. You can find more information on this German-language movie on Wikipedia and IMDb. Best running scenes ever! 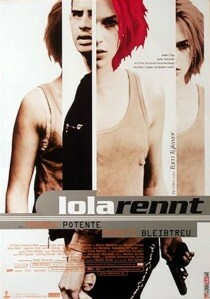 I wonder how many miles Franka Potente had to run just to make this cool film! One of my all-time fav indie/Euro movies. Excellent choice! Saw this and bought it as soon as the opportunity arose – great film. I loved this movie…a lot. A brilliant way to tell a story. I really like the soundtrack. This is a perfect example of the importance of music in films. One of my favourites films, I recomend you Volver from Pedro Almodovar, Nymphomaniac from Lars Von Trier and Fill the Void from Rama Burshtein.